Figure left: This HST picture of NGC 3603 illustrates the typical PDR situation. The FUV radiation of the massive OB stars ionizes the surrounding ISM;and creates a HII region. On its way farther out, the FUV photons are absorbed and the FUV intensity decreases. Once the hydrogen recombination probability overcomes the ionization probability atomic and molecular material can exist. The transition from the ionized to the atomic/molecular region is called PDR interface or transition region. PDRs (Photon Dominated Regions or Photodissociation Regions) are interstellar regions where stellar far ultraviolett radiation (FUV: 6 eV < h ν < 13.6 eV) dominates the physical and chemical properties of the local interstellar medium (ISM). FUV is predominantely produced in massive stars, which do not live long enough to exit their parental cloud of gas and dust within their lifetime. 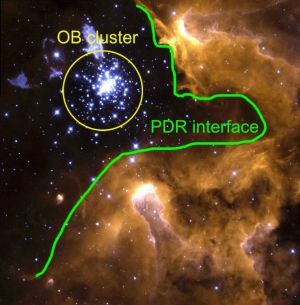 PDRs are the results of the strong mutual feedback between massive young stars and their parental clouds and hece closely realted to the process of star formation (SF). The FUV energy input in the PDR triggers many chemical and physical processes in the PDRs and their radiative footprints can be observed and used to analyze the local conditions in the emitting regions. Theoretical models addressing the structure of PDRs have been available for approximately 30 years and have evolved into advanced computer codes accounting for a growing number of physical effects with increasing accuracy. The different models have focused on the detailed simulation of particular processes determining the structure in the main regions of interest while using only rough approximations for other processes. The model setups vary strongly among different model codes. This includes the assumed model geometry, their physical and chemical structure, the choice of free parameters, and other details. These codes have been developed with different goals in mind: some are geared to efficiently model a particular type of region, e.g. HII regions, protoplanetary disks, planetary nebulae, diffuse clouds, etc. ; others emphasize a strict handling of the micro-physical processes in full detail (e.g. wavelength dependent absorption), but at the cost of increased computing time. Yet others aim at efficient and rapid calculation of large model grids for comparison with observational data, which comes at the cost of pragmatic approximations using effective rates rather than detailed treatment. As a result, the different models have focused on the detailed simulation of particular processes determining the structure in the main regions of interest while using only rough approximations for other processes. The model setups vary strongly among different model codes. This includes the assumed model geometry, their physical and chemical structure, the choice of free parameters, and other details. Consequently it is not always straightforward to directly compare the results from different PDR codes. Taking into account that there are multiple ways of implementing physical effects in numerical codes, it is obvious that the model output of different PDR codes can differ from each other. More details on the PDR Comparison Study. We use an updated version of the spherical PDR code described in detail by Röllig et al. (2006). Briefly, this model solves the coupled equations of energy balance (heating and cooling), chemical equilibrium, and radiative transfer in spherical geometry. The PDR-clumps are characterized by a) the incident FUV field intensity χ, given in units of the mean interstellar radiation field of Draine (1978), b) the clump mass, and c) the average density of the clump, and d) the metallicity Z of the cloud for a radial power-law density distribution with index γ.
Schematic plot of the spherical model structure on the KOSMA-tau PDR code. FUV radiation hits the model cloud isotropically. This leads to the typical PDR stratification, i.e. a chemical and physical layering that depends on Av. The major difference to a standard plane-paralle PDR model is the finite cloud mass and the finite angular size of the cloud. This leads to additional modeling effects, e.g. limb-brightening which is not easily produced in standard PDR models. 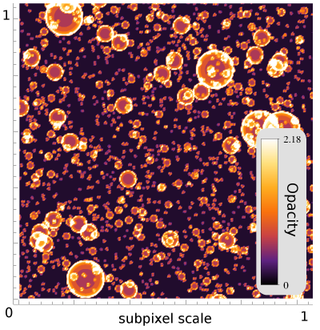 Another big advantage of the model setup is the possibility to superpose many different, single clumps to simulate a heterogeneous, clumpy composition as expected in any real molecular cloud. NEW: More details on KOSMA-tau are collected on a dedicated KOSMA-tau Webpage. [CII] optical depth distribution in a clumpy ensemble. The radiative transfer through the ensemble cannot be described by the average optical depth. Every cell in the 3D PDR model is composed of an ensemble similar to the shown one. The current development of the KOSMA-τ PDR-model is coordinated through project C1 of the SFB 956. We simulate a clumpy medium by the principle of superposition, i.e. we compose the clumpy cloud from a variety of identical 'building block' according to certain distribution properties. Using full size distributions of clumps we can mimick the fractal structure of the molecular gas in star-forming regions. As the KOSMA-τ PDR code only models individual spherical clumps, additional effort is needed to simulate the full complex structure of clumpy and filamentary molecular clouds in the vicinity of young stars. In previous approaches this was simply done by the superposition of an ensemble of clumps mimicking a fractal structure (Cubick et al. 2008). A proper treatment, however, has to take radiative transfer effects into account, in particular for the optically thick lines of CII and OI observed by Herschel and in future by SOFIA in configurations like the Orion Bar PDR. Existing plane-parallel PDR models always fail to explain the observed stratification of this region when fitting the line intensities. We implemented an extension of the KOSMA-t model by assembling a full three-dimensional model of the Orion Bar from an ensemble of clumps with an appropriate mass spectrum, immersed in a thin inter-clump medium, including the effects of FUV and FIR radiative transfer. This model provides for the first time a self-consistent picture of the stratification structure of the Orion Bar PDR simultaneously fitting the line intensities and the relative spatial shifts of the emission profiles. The 3D clump-ensemble model (KOSMA-τ-3D) is defined in a flexible way so that it is planned to be applied to many more regions with more complex structures such as M17SW and whole starburst galaxies or the Milky Way. Left: Schematic picture of the 3D model for the Orion Bar. Every cell contains an ensemble with a size spectrum of KOSMA-t model spheres. The ensemble properties can change from cell to cell. The colors represent the strength of the incident UV flux. Right: Simulated intensities across the Bar for some selected transitions (from left to right): [CII], CO 6-5, CO-16-15, 13CO 6-5, C18O 2-1. Intensities are given in K km/s. The stratification is clearly visible. We implemented an improved dust treatment including the continuum radiative transfer as well as the dust temperature computation for an arbitrary dust content of the model cloud. Using the description by Weingartner and Draine (2001) we can now account for different compositions and dust size distributions of large grains, very small grains and PAHs. The full description of this update can be found in Röllig et al. (2013). In a recent update we extended this description to also account for low metallicity environments, such as the Large and Small Magellanic Clouds. This was used in a recent work by Okada et al. (2018). 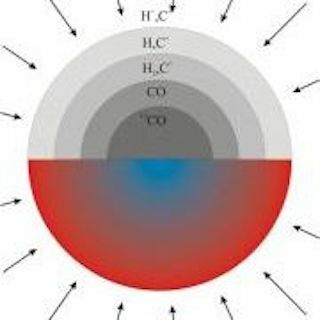 A detailed treatment of the dust temperature distribution is a prerequisite for an accurate computation of the H2 formation un the surface of dust grains. In particular accounting for strong chemical binding of individual H atoms on the dust surfaces (chemisorption) in addition to the physisorption process significantly improves the efficiency of the H2 formation under high temperature conditions. Following the approach by Cazaux & Tielens (2004) we now treat the formation of the hydrogen molecule much more accurately. As a side effect, the more efficient H2 formation addds a significant amount of heating to surface regions of a PDR leading to a strongly enhanced excitation of, e.g. high-J CO emission from the PDR. For details see Röllig et al. (2013). Extending the chemical network to a full set of reactions including the 13C and 18O isotopologues we studied the chemical fractionation in PDRs Röllig & Ossenkopf (2013) and compared the model results to Herschel data Ossenkopf et al. (2013). We recently included a full trreatment of surface chemistry to our model. Following the rate equation approach by Hasegawa et al. (1993), we now account for all important processes. We also developed an improved description of the chemistry induced desorption (e.g. Cazaux et al. 2016). A respective publication is in preparation. We included an additional set of numerical solvers to the chemical solution module of the model: DGESV, DGELSD (least squares), DGESVX are now available to solve the chemical rate equation system. As a fallback solution we are now able to compute a approximate steady-state solution by using time-dependent ODE solvers to solve the chemistry. This approach turns out to be very efficient in case numerical issues prevent a true equilibrium solution. In the longer perspective we will switch to a timedependent PDR model which is able to simulate all dynamic effects that can be deduced from the observed line profiles. By comparing this advanced model with the observational data we will be able to resolve the chemical structure and energy balance of interstellar gas in a highly inhomogeneous medium, understand the interplay between turbulent motions and radiative processes for the chemical evolution of the gas, and finally quantify the impact of UV radiation in the evolution of molecular clouds towards star formation. Markus Röllig and Yoko Okada are Co-Investigators of the ERS project "Radiative Feedback from Massive Stars as Traced by Multiband Imaging and Spectroscopic Mosaics". As preparation for the launch of JWST, we are updating KOSMA-tau to solve the full H2 problem (full ro-vib structure). In addition we need to account for non-stationary PAH heating. This is work in progress. KOSMA-tau results will be made available on the PDR model database ISMDB of the Meudon group in order to allow a comparison between both models. Schneider et al. (2018), A&A, 617A, 45S, "Anatomy of the massive star-forming region S106. The [O I] 63 μm line observed with GREAT/SOFIA as a versatile diagnostic tool for the evolution of massive stars"
Okada et al. (2018), accepted by A&A, "Velocity profiles of [CII], [CI], CO, and [OI] and physical conditions in four star-forming regions in the Large Magellanic Cloud"
Andree-Labsch et al. (2017), A&A, 598, A2, "Modelling clumpy photon-dominated regions in 3D. Understanding the Orion Bar stratification"
Röllig (2016), Nature, Volume 537, Issue 7619, pp. 174 "Astrophysics: Violent emissions of newborn stars"
Röllig et al. (2016), A&A, 591, A33, "[C II] 158 μm and [N II] 205 μm emission from IC 342. Disentangling the emission from ionized and photo-dissociated regions"
Okada et al. 2013, A&A, 553, A2, "Probing the role of polycyclic aromatic hydrocarbons in the photoelectric heating within photodissociation regions"